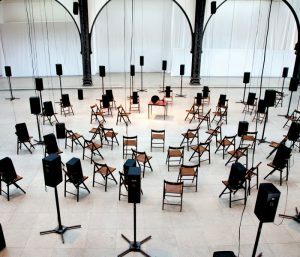 Louise Wilson and Janet Cardiff’s installations elicit he direct physical participation of the viewer. Part show & tell and science lab, this exhibition brings us into tactile intervention with the mediation of technology and the clumsy reality of our somatic roles within it. Wilson’s recent body of work has been significantly influenced by her participation as a subject in psychological and neurological experiments. Having placed herself in direct experiential contact with science (instead of through a secondary source such as literature) in order to arbitrate the human element within its configuration, she has opened up a virtual Pandora’s box. The fragile, unpredictable emotional self, often obfuscated by scientists when dealing with humans as subjects, is placed onto the operating table for dissection. To be a subject in science is to abandon the ego to the empirical process of verifiable “truths.” As a subject in an experiment one becomes the signifier of the norm (as opposed to a unique individual) and yet a unique trace from every subject is accountable in the end results. 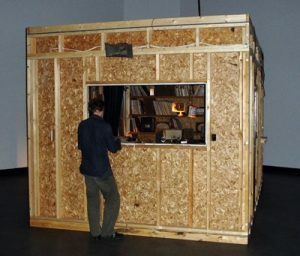 In the installation Possessed (1995), Wilson coalesced psychoanalysis and hypnosis with computer body imaging. The viewer was invited to step up onto a wooden platform dressed with an Oriental-type carpet and a dark burgundy divan which aesthetically alluded to the psychiarist’s office. The viewer could then recline onto the divan to watch a video from a television monitor hanging in very close proximity to their faces. A fifteen minute video session showing the location of “pain” and “visual activation” in a composite brain image, overlaid with hypnotic verbal commands, lulled the viewer into a meditative state. This technological apprehension of the self (or brain) lured the viewer into believing in the video’s interaction with the hypnotic process. (For example, in one stage of the hypnosis the viewer is told to erase a red “target” mark situated on the brain image. As the red fades away the viewer has the illusion of having mentally suppressed, or erased, the red.) The use of hypnosis with imaging technology in this piece links psychoanalysis (Freud used hypnosis in the early stages of his development of psychoanalysis) with modern neurological imaging research. By buttressing these two quintessentially influential projects of modern self-understanding, Wilson emphasizes how humanistic and philosophical projects are at play in scientific inquiry. In the winter of 1994 Wilson participated in a study entitled “The Role of Vision and Neck Inputs during Adaptation to Motion Sickness” that took place at an Aerospace Medical Research Unit in Montreal and utilized equipment soon to be aboard the Space Shuttle. The experiment required that the subject, after thirty minutes of self-generated motion sickness enhancing movements, try and fix the memory of a black target seen only moments before. The artist had portable computers attached to her head and back in order to monitor her movements while the experiment, which took place in the dark, was filmed in infrared light. A similar experiment was also executed with a monkey subject, where one of its brain cells was monitored on a video screen while the animal responded to visual cues. Abulia (1996) re-presents this experiment through the engagement of the viewer as subject. The title, describing a form of mental disorder involving the loss of volition, helps to identity the experiment’s stultifying effects. At the entrance of the exhibition space are placed a small table, with a night lamp, video monitor and a documentation binder. The monitor shows the mapping of something which, by reading the documentation, can be deduced as being the monkey’s activated brain cell. Behind the wall is a dark and coldly lit room with a small pedestal placed in the centre, permitting the viewer to step up onto the elevated level. From this vantage point the viewer can face a monitor on either the left or the right and is invited to slip on a pair of earphones. On the monitors we see the artist participating in the experiment, in a neck brace, turning her torso from right to left in order to induce motion sickness. Each monitor is intermittently interrupted, forcing the viewer to turn their head side to side in order to follow the experiment. Via the earphones can be heard the jargonized monotone of the technical directions from the experimenter which seldom corresponds to the actions taking place on the monitors. A ticking noise prompts the viewer/subject to switch from one monitor to the other and as the interruptions, and hence rotations, accelerate and slow down the viewer realizes that he/she is monkeying the experiment. The installation is far from polished, leaving gaps, and frustrating fissures in the viewership process. The popular media image of the hi-tech scientific research lab is usurped by a rudimentary laboratory environment which needs the physically laborious input of a subject. Wilson demonstrates how humans, as awkward and difficulty regulated subjects, are integral to scientific research and influential in the results. (The relationship of the experimenter with his/her subject is analyzed in interviews conducted with the experimenters and are available for consultation.) By making her viewers acutely aware of their roles as subjects (willing or otherwise) Wilson demonstrates that they are inextricably tied to the research process and that technology remains a very new way of self-learning, especially when probing our bodies. Janet Cardiff’s installation, To Touch (1993), presented in the main gallery, is also dependent on an intimate physical exchange with the viewer. A dimly illuminated and weather worn work table is the sole object of the exhibition. 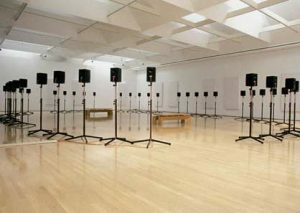 The artist invites the viewer to touch, and set into motion, a series of audio recordings emanating from the twenty speakers placed on the walls around the room. We hear the turbulent thoughts and dreams of different subjects (four in all) and must piece together the narrative by the repeated rubbing of the table wherein our hands become channel surfing antennas. Fragmented texts are overlapped with sounds of ringing telephones, thunder, rain, knives being sharpened and carnival music, making the stories impossible to follow. A pervasive frustration is felt by the viewer who, having understood the mechanics of the piece, remains unable to follow the stories through to their conclusion. If one desires to be closer to the remote speakers to better distinguish the narrator’s voice, one must move away from the table, and lose all physical contact and interaction. Therefore, the control that the viewer exerts in the construction of piece is repeatedly being negated in the process of its fabrication. This piece, relying on postmodern deconstructive tactics, stutters and circuitously runs on its own treadmill regardless of the viewer’s tender cajoling of the table surface. In these installations we are required to interact with technology, and at times we sense that the machines have understood our gestures whereas at other times we are befuddled in our attempt to understand theirs. This courtship of our body with technology (and its mediated self) requires much patience and in the process we may learn to recognize the iconology of our mutual gestures as we tip our hats to one another. If the images assembled in the Airmail Paintings can be read as inventories or indices, as I believe they can, they measure and give form to the distance which separates human subjects from their basic existential and historical circumstances. Alongside the inventory of faces and images of dead bodies, we find repeatedly drawings of houses, beds, carts and animals, frequently derived from “how to draw” manuals of the 1950s. These images are schematic with a naive quality of wanting to get it right, in the sense that all that matters is that the object can be identified. To picture is, to be sure, to possess, but the very fact that these drawings follow instructions and models also withholds them. The house is no longer my house but a wish, already formulated elsewhere and in advance, for a house, a home, a point of arrival, or of something to be left behind, etc. And where the object itself is presented, as in the feathers stitched onto several of the Airmail Paintings, we are equally uncertain about their meaning. Are the feathers a metonymy for nature, do they suggest flight, or refer to adornment and decoration? Are they tools for writing? While in each instance it is easy to identify the object, attempts to establish what the representation of the object, or the object as a representation, might mean leads to an identification of a different kind, with a particular way of looking and reading which constitutes a community of readers. By a community of readers I do not mean a group of people who agree on a particular interpretation, nor do I have in mind a group preconstituted by common ideology or belief. What I want to suggest is that a certain kind of art, to which the Airmail Paintings belong, constitutes communities of readers in allowing them to be located and specify a level of shared experience. In Dittborn’s case, at least two such communities can be distinguished. 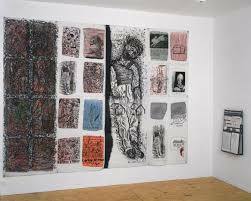 The first of these can be identified with regard to the historical context in which Dittborn’s art practice evolved. Dittborn belongs to a group of artists and intellectuals who remained in Chile after the coup in 1973. This group had to negotiate the restrictions imposed on artistic activity by censorship and the absence of institutional support, not to mention the dangers to personal safety posed by the dictatorship. In addition they had to operate in a cultural context impoverished by emigration when after 1973 an extimated one million Chileans, about ten percent of the population, became exiles. Caught between the risk of official absorption … by the dominant apparatus, and the danger of their forms becoming an instrument of the opposition’s progressive ideology, these practices in fact insisted on an equivocal type of message and resisted any totalization of sense. 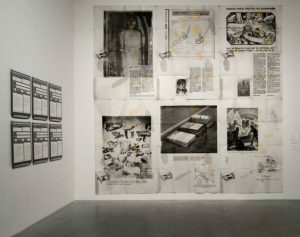 Thus they proliferated signifiers in order to prevent a reductionist interpretation, they offered many possible readings through the use of multiple, fluctuating referents. Censorship leads to work being made which calls for a reading centred around the unsaid rather than any discernible content or message. This practice demands a heightened attention to the workings of pictorial and linguistic signs both on the part of the artist and the viewer. Reading between the lines and searching for implicit meanings creates audiences of accomplices who are able to interpret the work in the light of particular experiences and the circumstances. More generally one could say that such audiences form where and whenever the unsaid becomes the structuring principle of reading in the face of repression. The second community of readers, among whom I count myself, begins by approaching the work at face value, only to discover that it cannot confer value on the face the way it thought it could. This realization opens a space for interpretation while insisting that the reading be in transit also, and conscious of its limits and partiality. While the Western metropolis remains the centre of the art market, the Airmail Paintings suggest that conceptually at least, it has become a location of departure as well as of arrival. Folds are the marks of a past transition. They become visible in the act of unfolding a surface, and remain as the visual reminder that this surface has temporarily been else-where and invisible. Usually we unfold a surface either to cover something (a tablecloth to put on a table, a sheet to cover a mattress, a blanket to cover ourselves, etc.) or in order to read (a newspaper, a letter). In the first instance we unfold fabric, in the second, paper. While the Airmail Paintings include both of these aspects, particular attention is drawn to their existence as letters. First and foremost, the folds emphasize that the painting was sent from a different location and by extension, that it was made in a different place and context from the one it is seen in. The latter, of course, is true of most art in museums and galleries; in Dittborn’s work, however, the passages inscribed in the paintings suggest that each arrival is also a (potential) point of departure, and that each departure includes a possible return. What has been called “airmailness” of the paintings articulates a particular temporality of transit which can be distinguished from both the linear time of history and project, famously attacked by Walter Benjamin in his Theses on the Philosophy of history, and from mechanistic notions of reversibility. Here, the sending out and return to sender is neither a reversal between two states, nor the synthesizing movement of a dialectic. The Airmail Paintings unfold in several directions simultaneously, each of which involve specific and different time frames. 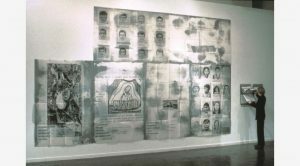 I want to make reference to three particular moments inscribed in the work first, the specificity of Latin American art, secondly, the Chilean context, and thirdly, the signification and significance of the work in the theoretical and institutional context of contemporary art in the metropolis. Our roots are European, but our horizon is the land and history of the Americans. This is the challenge that we confront each day of our lives and that each of us must meet in his own way. Latin American literature is simply the sum total of answers, each of them different, that we have given to this question put to us by our original conditions. The same can be said for Latin American art. The much commented on hybridity of genres and styles, the coexistence of different temporalities, and multiple signs of discontinuity and rupture in Dittborn’s work, may be understood as to some degree inherent in the original condition Paz refers to. 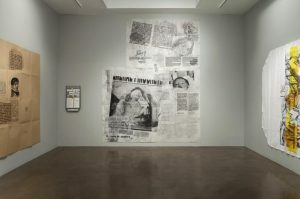 In this sense the work relates to an experiential level grounded in a history and its vicissitudes which, some may argue, inaugurated modernity precisely as a rupture in the conjunction of a “civilizing mission” with its legitimizing discourses, and the most extreme forms of state power on an unprecedented scale. Latin American art developed as an art of mediation and translation, of the traffic between cultures, and the effect of time gaps between departures and arrivals. Origin and originals were located at a distance in Europe, and in their transport to the Americans, an insurmountable split became constitutive of artistic representations which doubled as signs of cultural regulation even when they where not explicitly didactic. Take the example of colonial painting which Dittborn has commented on in relation to his own work. Those paintings, especially of the eighteenth and nineteenth centuries, typically combine religious images with writing. The text often functions as a caption which doubles and details the scene in the picture for an audience presumed to be ignorant of Christian iconography. While the doubling works to reinforce the message, religious or other, it inadvertently also indicates a measure of anxiety that accompanies the clearly perceived instability of the visual sign. The Airmail Paintings cannot be reduced, however, to a cultural and historical legacy premised on “this traffic of the truth where the truth is the truth of traffic.” What occurs across these paintings is a doubling of allegories of transit with allegories of human transience, and it is in the correlation of these two themes that the work claims legibility. Some of the images frequently used in the paintings are of violent or accidental death: a motorcycle accident, the death of a boxer, reproductions of the print The man hanged by landowners by Jose Guadalupe Posada, and images of dead bodies preserved almost intact in ice, salt or sand, such as the Inca mummy of Cerro El Plomo, the body of the English Sailor John Torrington, and that of a political victim found after seventeen years in the desert in northern Chile. A photograph of the artist’s newborn daughter includes in the caption a reference not only to the beginning of a “journey through the world” but also to death, “This [the birth] took place on the first floor of the same hospital in which my father died on December 4, 1979 at 6 P.M. on the fifth floor” (Airmail Painting No. 90: The Corpse, the Treasure). This emphasis on death parallels a concern with the photographic image in particular, as an ossifying and mummifying process. In the preservation of death beyond the moment of dying, the photographic image recreates a shared existential condition as spectacle and artifice. This movement is conspicuous in Pieta, an early Airmail Painting of 1985. The image, which also appears in previous and subsequent works, shows the pain-ridden body of the Cuban boxer Benny Kid Paret stretched on the canvas in Madison Square Gardens in New York. Broadcast on American television, a U.P.I. photographer shot the still from the screen, and the Chilean magazine Gol y Gol acquired the image from the same agency and printed it in 1962. In the late seventies, Dittborn came across an issue of the magazine in a secondhand bookstore in Santiago and started working with the photograph, transforming it further through enlarging and reprinting. The pieta forms part of a visual narrative of life and death which includes in its representations a temporal dislocation in symbolic prefigurations of death. (6) More generally, and retroactively, the celebration of popular heroes as “living icons” may well be understood as anticipating their survival as an image. The Airmail Painting Pieta allows the viewer to trace the different stages of the picture’s journey, while the title points to another tradition of transforming death into image and spectacle. In the religious context, however, pieta also reminds us of something conspicuously absent from its secular versions, the emotions of pity and of mourning which involve memory based on the recognition of loss. In this context, the Airmail Paintings as unfolded letters relate to a rich tradition in European painting. In this tradition in writing figures prominently as part of the painted composition in order to establish a connection between transience and death, and memory and remembrance. In 1644, Cesare Ripa’s Iconologia already lists “writing” and “the book” as attributes of both memoria and historia. In Dutch vanitas still lives of the seventeenth century, the unfolded letter frequently appears alongside the opened book. Unlike contemporary genre scenes which depict the writing of letters, here the letter is displayed as unfolded to indicate that it was sent, and has arrived from a scene outside of the one depicted in the painting. With the emergency of vanitas still lives as a separate category of still life painting at that time, the inclusion of writing and particularly of the letter into the composition signals a shift in the understanding of visual allegory. Writing, the open book, individual pages of texts, and unfolded letters, can be distinguished from other allegories of transience such as the skull, the burning candle or the hourglass. Reading takes time. The texts tell stories; they narrate events which themselves have allegorical dimensions. Writing already involves intention, interpretation and (mis)understanding, in short, it inscribes a relation between human subjects. The book sets out a relationship between author and reader, the letter between sender and addressee. The writing depicted in these paintings, therefore, can never be regarded simply as an object in the way burning candles or a skull can be regarded as objects. While the letters and books in the vanitas paintings clearly function as attributes, they also multiply and thereby complicate and disturb the allegorical reading. The text of the unfolded letter or the open book which is legible in and as part of the painting can no longer be regarded only as part of a pre-established allegorical vocabulary. The prominence of writing in these allegories of transience and human death, while reminding us to remember that time reading of the painting itself includes an aspect of the transitory, as the relationships within and between the elements in the work no longer unfold strictly within the timelessness of its theme. The citations, the captions of photographs, and visual inventories in Dittborn’s work present a collection of fragmented allegories. They appear as ingredients to a dish which cannot be cooked because the taste of each ingredient, instead of blending, would interfere with and cancel the others. Technologies of visual communication and the traffic in images is shown to diminish and expropriate the space in which secure identifications can be made. In their unfolding, the paintings offer a surface without frame across which we attempt to link associations clearly relative to our own location. Only temporarily and partially do we cross paths with this work, and yet, in its emphasis on mortality, transit and the faces that despite all mediation still meet our gaze, we are confronted with the intimation of human communality as a being in common that can only be articulated terms of a distance from others. Despite the loss implied by this, or perhaps because of it, we are able to acknowledge others. This acknowledgement proposes a relation that is not determined by our ability to forge a common identity. Nonetheless, it is a relation to other subjects, and to locations and moments different from our own. Images of faces, a house, a hanged man. More faces stitched onto the painting, and a mummy. Children’s drawings, dead bodies. Texts. Captions. Folds. A raft, yes I remember a raft also, stitched onto colour stains and drips along with footprints, a snail, and a house. But when I think of the different Airmail Paintings I have seen over the years, the faces predominate. And a particular sense of lightness which has to do with the materiality of these paintings on white, non-woven fabric, or brown wrapping paper — paintings that are unfolded rather than stretched, and which announce in their folds another mode of existence as letters sent through the post in airmail envelopes. It takes time to look at this work, time to read it. Here looking is already a kind of remembering. 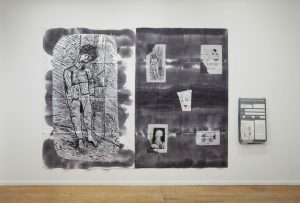 As you walk along the frieze-like rows of images extending along the wall in the History of the Human Face, for instance, but also when you look at a single sheet piece such as Pieta, seeing elements the conscious experience and memory of attempting to correlate different elements that do not integrate into a single vision. Hence the memory of encountering this work as repeated moments of looking, of following traces and leads in the folds of these gatherings of images, out of envelopes onto gallery walls, and yet always in transit. Moments of contact that yield no synthesis, no revelation, or other point of narrative closure. I remember my excitement the first I came across Dittborn’s work. The beauty and intelligence in its immodest use of cheap and found materials, its insistent seriousness all the while playfully manipulating established formats and techniques. I find these paintings deeply moving and intellectually challanging at the same time. In part at least, the challenge they present is to understand their affective power. In what follows I want to concentrate on this relation which, initially, may be formulated as a question. How can we articulate visual pleasure when it is so closely bound up with the transitory, this ceaseless oscillation between the mirage of identity and the non-identical? [W]hat emerges is a paradoxical insight. The work makes absolutely specific its point of origin and destination in time and space, and at the same time intimates that there is no absolute point of origin and destination. It rescues a notion of the local, only to show that the local, like the global, is an abstraction, the conjunction of many planes of experience and time scales. Conversely, it ranges the global and participates in the international “research community” of the artistic vanguard, only to point out that it is the product of a specific cultural history. What then is the pleasure we take in these works which draw us into their visual field without allowing us to settle there and inhabit them with our ready-made concepts and ideas? How do we look at those faces from police files and anthropology books of people long dead, anonymous, killed off, given European names for the record, their “identity” the product of social technologies? How do we measure the distance of these remote faces which nonetheless touch us? In his work, Dittborn stages the human face as the site of an extreme and irreducible encounter. In the juxtaposition of photographs, police artists’ renderings and drawings by his seven-year-old daughter, the face is emphasized as (con)figuration. Cognitively, a photographic portrait and a circle with two dots and a line both register as faces. Yet we immediately begin to differentiate. A face is never simply a face. Even in the most fleeting encounter we look for expression, which is to say that we look for difference from, and excess to the configuration of simply “a face.” This difference can pertain to a collectivity, an ethnic group for example, or to individual difference, recognizing a particular person. It can pertain to internal states and emotions: concentration, sadness, alertness, apathy; or respond to something external: staring, frowning, laughing at. To look at a face is to look for a way to measure the distance, not between some pre-existing reality and its subsequent representations, but within the folds, seams and stitches of the configuration which constitutes a face. To look at a face then, is to look at and for something that in its very nature never coincides with itself. The predominance and particular arrangement of faces in the Airmail Paintings, I want to suggest, point us in a direction where notions of transit, and of folding/unfolding, begin to cohere around a particular relation that is established vis a vis the face. When we look at a face we do so as subjects who themselves have and make faces. No matter where and how we come across the History of the Human Face (begun in 1989), our own face makes us party to that history. Yet, we do not recognize ourselves in the other’s face. As Roberto Merino put it, “these printed gazes are equivalent to fossilized light – the light that reaches us from the stars long after they have been extinguished.”We do not identify the faces (we identify particular representational formats and techniques), even less do we identify with them. What we make out instead is the gap that separates us from those faces, and a displacement which occurs with respect to our own location and identity. Thus, it is precisely in what forges our common humanity, that the limits of identity and the identifiable are most strongly felt. In a new dynamic anthology on performance art in England and the United States, editor Catherine Ugwu does not seek to locate a definition of performance art, but rather what political ends it can achieve. Her focus is the emergence and evolution over the last decade of politized black British and American live art in relation to wider political concerns of colonialism and the processes of de-colonialization. Structurally Let’s Get It On consists of two main components: eight essays which provide a political and cultural context, and ten artists’ pages which give a direct voice to some of the artists operating within current practice. This combination allows the well-known academic voices of theorists such as Paul Gilroy, bell hooks and Coco Fusco to be heard in tandem with the anti-academic and anti-institutionalist Ronald Fraser-Munro, or the “automatic rap” – DON’T GET ME STARTED. GIDA PA. – of Chila Kumari Burman. Rather than being fractious, the different voices provide a rich and accessible, and coupled with lots of reproductions, a fun and funky look at contemporary performance art. On a more serious note, Let’s Get It On tackles some crucial and compelling issues such as the inbetween space of the diaspora, performance art as a site of resistance, and the political implications of a “black arts movement.” Moreover, it achieves its political ends without, which is so often not the case, removing the spirit and ingenuity of the art. As such, Let’s Get It On indeed demonstrates not what performance art is, but what it can do. C. S.